If you were a broker listing a boat in the United States recently, odds are you were glad if it was over 55 feet or shorter than 26. 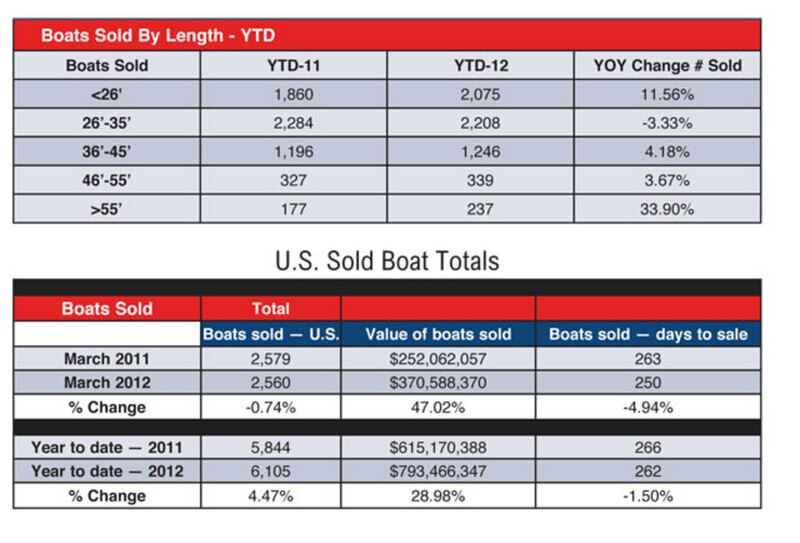 According to YachtWorld.com member brokerages reporting in their proprietary database, SoldBoats.com, those categories made the best sales gains in March, compared with the same month the year before. Overall sales volume of 2,560 boats in the U.S. brokerage market was down 0.7 percent in March, but the aggregate value of all sales was $118 million higher, or 47 percent, compared with the previous March. In the first quarter of 2012, 6,105 boats were sold, a 4.5 percent increase from 2011. Total sales valuation climbed 29 percent, to $793.5 million, and the trend of the last several months toward lower average time on the market before a sale continued. The 250-day average in March was lower than in any month since early 2009; the average for the quarter was 262 days. In March, U.S. brokers sold 10 percent more boats under 26 feet than they did the previous year, closing deals on 924 boats. For the quarter, the category totaled 2,075 sales, an 11.6 percent gain from 2011. The total value of boat sales in the category was $42 million, up 13 percent from $37 million a year earlier. At the other end of the spectrum, 92 boats over 55 feet were sold in March, a 39 percent increase from 2011, and the total value of those sales was up 151 percent, at $189 million in sales. Nineteen of those 92 boats were superyachts of 80 feet or longer and they alone sold for $128 million. For the quarter, 237 boats over 55 feet changed hands, 60 more than a year earlier. This 34 percent increase resulted in a $165 million increase in aggregate sales value. However, most of the valuation gain occurred in the superyacht segment, where 48 boats sold for an average price of $4.5 million; in the first quarter a year earlier, 30 boats sold for a $2.4 million average. The weakest-performing segment of the market — and the main reason that sales were slightly lower for the month — was boats 26 to 35 feet. Only 905 of them were sold in March, down 120 boats, or 12 percent, from March 2011. The aggregate value of the sales decreased nearly in proportion, by 11 percent, to $50 million. For the quarter, sales of boats 26 to 35 feet dropped 3.3 percent, to 2,208. Among boats 36 to 55 feet, sales increased by 5 percent, to 1,585. Looking at the U.S. monthly boat sales graphic, although overall March 2012 sales lagged slightly behind March 2011, in every month so far this year the sales volume has exceeded the 5-year monthly average. John Burnham is editorial director of Dominion Marine Media.